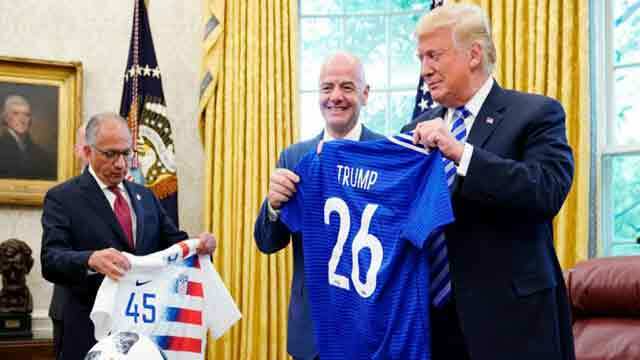 Washington, Aug 29 (Just News): President Donald Trump welcomed FIFA boss Gianni Infantino to the White House on Tuesday, congratulating football's governing body for awarding the 2026 World Cup to North America before jokingly waving a red card at journalists. "I very much appreciate the fact that we have won a very important event, the World Cup in 2026," said Trump, who had backed the joint USA-Mexico-Canada bid which triumphed over Morocco at a vote in Moscow on June. Trump meanwhile revealed that his 12-year-old son Barron was a keen football fan while describing the World Cup as "maybe the biggest sporting event in the world." "Soccer is a game, I guess you call it football," Trump added. "But over here, maybe at some point they'll change the name, I'm not sure. But we'll see. It's working very well either way." "I won't be here. Maybe they'll extend the term," he said to laughter, as he gestured towards media. "Because I know they'd love to see that. If they don't extend the term, the media is going to be very boring, they'll all be out of business I guess." Infantino meanwhile said FIFA was confident of helping produce a "fantastic" tournament in 2026, before presenting Trump with two soccer jerseys -- one bearing his name and the number 26 (referring to 2026) and other with the number 45, denoting Trump's status as the 45th US President. Infantino then handed Trump a pair of referee's yellow and red cards, before explaining their meaning.